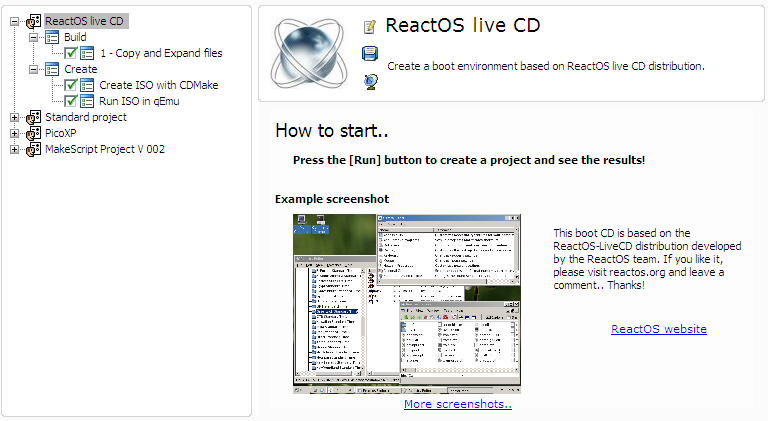 This project will create a boot disk ISO image based on a ReactOS Live CD. More informations about ReactOS can be found here along with some screenshots. At this moment the goal is to demonstrate how to automate the process of extracting all files from the ISO that is automatically downloaded onto a folder, apply scripts to tweak user settings and add programs - followed by the recompilation of this folder into ISO format again. The resulting ISO is not tweaked yet, but should be a good starting ground to make improvements or just to try out other options. I really like the idea of using a free operative system and perhaps this way more people can get to know and use it..
- Add the project on winbuilder - how to..
As an alternative you don't need to use cdmake and can always use mkisofs to produce your ISO, just place it inside the ReactOS\Create folder and remove or disable "CDMake.Script"
It's also adviced to use WinBuilder 053 beta 4, otherwise it will still work but you won't see the download progress..
Hope you have fun and enjoy this OS..
Edited by Nuno Brito, 04 December 2006 - 01:34 PM. I've downloaded the project and run it in WB053 beta5 with no changes, and got the attached error. I haven't looked into it yet, to try and see what's wrong. ADDED: I've run it againg, and it works!!! Still need to figure where to remove the option to "Press any key.."
THe process to download seems to occur but when it goes to running it in qemu nothing happens. Qemu doesnt come up. Using Winbuilder 53 build 5 and added cdmake inside Tools folder. Directory structure in Wuilbuilder projects. I thought everything had been made clear, as reported here, but now, working with the files in the folder generated by the project, I can't make a bootable ISO with MkISOfs. As you succeeded re-creating an ISO with CDMake and MkISOfs, could you add a script which uses MkISOfs to create it? I'd like to examine it to definitely understand what happens. This is not a top priority, of course! Looking at your log I see that the files were not extracted to reactos\ReactOS-liveCD, on the project folder unpack ReactOS.7z into a folder called ReactOS-LiveCD. Keep the the 7zip file to avoid downloading a new one. This should get your ISO built - but doesn't explain the reason why the files aren't expanded from 7z.exe in the first place. Anyone has any more ideas? btw: Looking better at reactOS, the hive files are simple INF files wich can be compiled whenever we wish, this is very usefull to avoid all the hassle of loading/unloading hives, I include a sample of my files - it really has potential.. I'll post some ISO's when I get more familiar with this OS, ROS has the advantage of being open source so we're free to publish them as well.. It really seems that your files are not being extracted as necessary, inside ReactOS.7z is the whole file structure - I've noticed that a few unzip program will ignore empty folders, but we need those empty folders to be placed inside the ISO otherwise an error like this will occur. Please note that I'm using isoboot.o as boot sector placed inside the root of target folder. I haven't yet scripted this syntax, but you should be able to do it yourself using the command line to see what goes wrong - I'm guessing your troubles are actually coming from the folder structure. I hope this helps, good luck with ROS..
Added a mkisofs.script for ROS on the first post.. I've finally found the reason of the mistery that was making me crazy! The problem was neither with the extraction, nor with the bootsector, everything was right. The problem was MkISOfs syntax. and this way it works. ShellExecute,"hide",#$q%Tools%\qEMU\qEmu.exe#$q," -boot d -m %pNumberBox1% -hda #$q%Tools%\qEMU\hdd.img#$q -L #$q%Tools%\qEMU#$q -cdrom #$q%ISOfile%#$q%usb%%fullscreen%%uselocaltime%%kqemu%%audio%"
After manually extracting to ReactOS-LiveCD folder and running the Project again. ReactOS boots up. This script seems to be running fine, the reason for this problem can likely be found on the rest of the project - can you please completely delete your folder reactOS project and then unpack it again? I think it might likely be a corrupted download - need to add some MD5 checking to downloaded files, perhaps inside the webget command. This way will repeat the download of reactOS.7z into your project folder. Please repeat the process from the begining and then if this persists, place the log for the whole project, this will help to understand what is going wrong. makeISO will use a Target folder sized in 62,9Mb with 473 files and 17 folders. Might also be worth to check on a path without spaces. Now that we (finally! ) 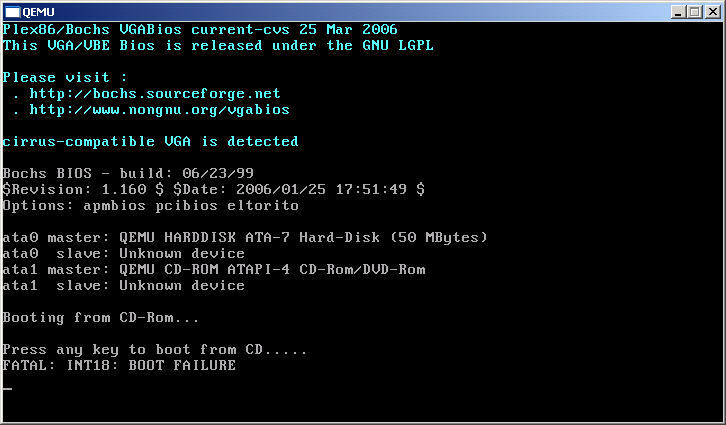 can extract the ReactOSLiveCD.ISO to a folder, recreate a booting ISO from there and run it in qEmu, how can we add programs to the OS or otherwise tweak it without losing changes? ...how can we add programs to the OS or otherwise tweak it without losing changes? 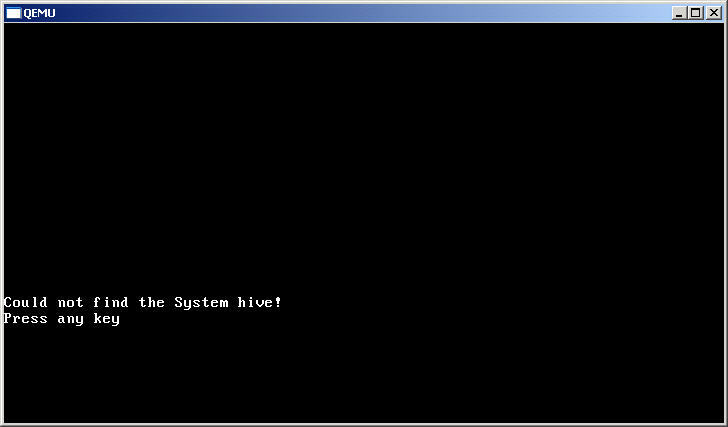 ReactOS allows to recreate their registry hives in INF format - they are made using a tool called mkhive, meaning that we can write all registry values onto inf files and then just recompile the hives ready for deployment.. I think we've learnt enough from the standard and picoXP projects to understand how to make things work more efficiently, so the next step could be adapting the buildmodel from psc to be used both for PE and ROS based boot CD's.. Thanks, I had missed that post, sorry for asking again. ok that could be it. none of the scripts that use wget have been working for me lately. I think it's because i have an older version already installed maybe. Your post was really usefull to understand that it is necessary to add MD5 validation, thank you!